When it comes to choosing the type of furniture for your home, wood veneers have many advantages, but there are also some considerations to think about before making a purchase of furniture with wood veneers. Here at Sauer & Company Veneers, we have been supplying veneers for over 50 years and now ship wood veneers worldwide for many different applications and uses. 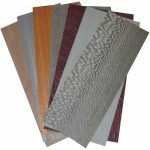 Wood veneers allow you to get the look of natural wood at a much lower cost. Because it is a thin layer of natural wood, each wood veneer is unique and allows for many design options, including a variety of polish, varnish and stain options to change the look of the wood. Particle board and other fiber boards may not be as strong without wood veneers. A properly installed veneer gives these substrates more durability, water resistance and strength. Wood veneers are very eco-friendly. They reduce the amount of freshly cut wood needed to create beautiful furniture pieces. They can also be recycled into fiberboard or particle board later on. If you are looking for a nontoxic option, wood veneers are a good choice. There are non-toxic adhesive options on the market for a finished product that doesn’t give off any VOCs (Volatile Organic Compounds). While wood veneers are more water resistant than particleboard, they are more likely to warp from water damage than solid wood. Installation of wood veneers can be challenging and should be done by a skilled craftsman for optimal results and longevity.